Peel the bananas and break them up into chunks. Wrap them and freeze overnight. Preheat the oven to 350 degrees C. Spread the coconut onto a baking sheet or a piece of foil, and put it in the preheated oven. Toast the coconut until it's a golden brown, being careful not to burn it (about 5 minutes). Let the coconut cool to room temperature. To make the ice cream, put the frozen bananas, coconut cream, maple syrup and vanilla into a high speed blender and blend starting at low speed and working your way up gradually to high speed until the mixture is smooth and creamy. Do not over-blend, otherwise the friction will melt your ice cream. The ice cream can be served immediately as soft-serve, or you can put it in an air-tight container and place it in the freezer for a few hours to set it so that it has the texture of a store-bought ice cream. 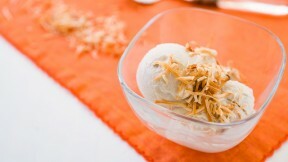 Serve the ice cream with the toasted coconut sprinkled on top.